This is a cermemonial magic oil blended from aromatic plant materials. Its name came about due to its having been described in a medieval grimoire called The Book of Abramelin written by Abraham the Jew (presumed to have lived from c.1362–c.1458) who was a fmaous Kabbalist. The recipe is adapted from the Jewish holy annointing oil of the Tanakh, which is described in the Book of Eodus (30:22-25) attributed to Moses. 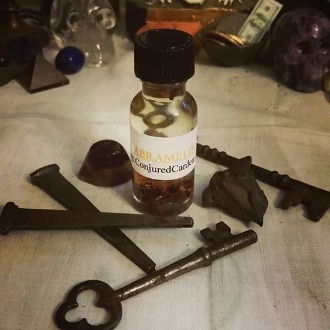 This oil is reputed to enhance workings, magic and communication with spiritual guides. Mine is created from cinnamon essential oil, galangal root, myrrh gum and calamus root.